Inappropriate in All The Right Ways takes the audience on an audacious, disastrous and glorious ride that culminates in audience members taking the stage. What if our tragedies were our greatest triumphs? Our public self was our most private and the worst and the best moments of our lives turned out to be the same? Join Ann Randolph in a unique theatrical experience where sharing her story, from never paying rent by living in boats, tents and mental institutions to hooking up with Mel Brooks for an off-Broadway run, invites you to experience and express the miraculous in your own. As Randolph has taken INAPPROPRIATE across the country, countless people, red, blue, old, young, right, wrong, short, tall — people different from each other in every discernible way — share, accept and embrace what makes us all of us human. Loveland follows the journey of irreverent oddball, Frannie Potts, as she flies cross-country to attend a family member’s funeral. She breaks down while soaring over the nation’s heartland and Randolph brilliantly portrays a plane full of hilarious characters in a show that is both achingly funny and achingly poignant. Randolph’s fearless performance exposes the laugh-out-loud combination of absurdity and wrenching emotion that results when grief strips us of our inhibitions. “Compared to Gilda Radner,” (The San Francisco Examiner) and hailed as “a genius” by comedy master Mel Brooks, Randolph is one performer not to miss. With pathos and humor, Randolph skillfully weaves together stories about working in a women’s homeless shelter and the pursuit of true love. Her painfully funny portraits of the shelter’s residents, and hilarious account of her hiking trip with Harold, the accordionist of her dreams, are beautifully drawn in this poignant tale about finding dignity and grace in unusual places. 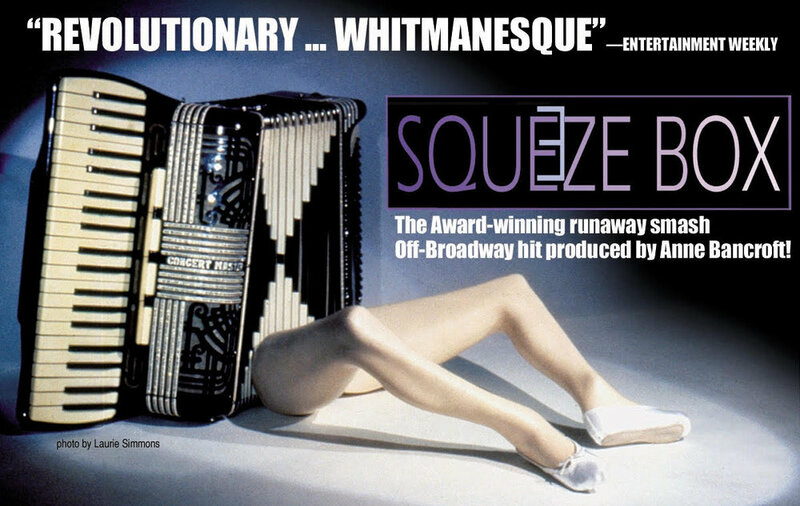 Squeeze Box played in NYC for 6 months before touring the US’s regional theater circuit and headlining the Edinburgh Fringe. A collection of outrageous monologues. For a full list of shows/performances, please contact Ann.